But that was about as far as Brand went. He had nothing to say about the insidious role of the BBC in maintaining support for the crushing economic and political system that is, as Brand stated, destroying the planet, creating massive economic disparity and ignoring the needs of the people. By agreeing to enter the lion’s den of a BBC interview, edited and packaged as a high-profile 10-minute segment on Newsnight, knowing that he would likely boost viewing figures amongst a target younger audience without drawing attention to these parameters, far less criticising them, Brand let a major component of state-corporate power off the hook. He effectively contributed to the illusion that the BBC is a level platform for reasoned, vigorous and wide-ranging debate on the most serious issues affecting people and planet. This matters because, as we have noted before, the most effective propaganda systems provide opportunities for somedissent while the overwhelming pattern of media coverage strongly supports state-corporate aims. And the BBC, regarded by many people as the epitome of all that is good about Britain, is arguably the most powerful media institution in this equation. After all, the BBC is still the news source for the majority of the public, and thus the establishment-friendly window through which the population views domestic and world affairs. An opinion poll published in May 2013 showed that 58% of the British public regards the BBC as the most trustworthy news source, far higher than its closest rivals: ITV (14%), Sky News (6%), Channel 4 News (2%) and the Guardian (2%). The irony is that Brand referred in the interview to the safety ‘valves’ that allow steam to be let off, keeping an unjust system in place. But he was only referring to recycling and driving ‘greener’ cars like the Prius which ‘stop us reaching the point where you think it’s enough now’. So when is it ‘enough now’ to draw attention to the destructive role played by powerful elite news media, most especially the BBC? The trivial diversion to the topic of Paxman’s beard meant that Brand’s question, ‘Well how come I feel so cross with you?’ was left hanging in mid-air. This is the point where Brand could, and should, have gone on the offensive about Paxman’s privileged position as a supposed fearless interrogator of power, the BBC man’s connection with the British-American Project once described as a ‘Trojan horse for US foreign policy’, and then extending to a critique of the BBC itself. There is no shortage of examples of BBC propaganda that could have been raised. Tom Chivers, the assistant comment editor of the Daily Telegraph told his readers that Brand is an ‘unnecessary revolutionary’, and that basically the current system of capitalism works fine apart from a few ‘pockets of regression, little eddies in the forward current’. To be this openly credulous, to declare a belief in something because ‘our leaders say so’, is a remarkable admission for an ostensible journalist. Simon Kelner, editor-in-chief of the Independent newspapers, acknowledged that Brand ‘articulates a strain of thinking among a growing number of young people’. True enough. But Kelner made sure his readers knew that Brand’s call to overthrow the system of capitalism that is killing the planet is ‘Spartist nonsense’. But is this really any different from what environment and social justice campaigners have been saying for decades? Go back to the 1980s, and weren’t we hearing the same thing from Jonathan Porritt and the Greens, Friends of the Earth, Greenpeace and other campaigners? In many media alerts over the years, such as here and here, we have pointed out that the corporate media has long suppressed, marginalised and diverted any radical challenges to the status quo. Campaigners and activists, of whatever hue and driven by whatever issue, can no longer ignore this crucial issue. Even in Brand’s 4500-word New Statesman piece, he had very little to say about the corporate media. There were two passing mentions of ‘media’, but no mentions of ‘press’, ‘journalism’ or ‘television’. Perhaps we should not be surprised that the well-intentioned Brand, a former ‘MTV journalist’, presenter of Big Brother’s Big Mouth and an actor in big-budget movies, should have a bit of a blind spot when it comes to the corporate media. Others applauding Brand on social media included Alain de Botton and Jemima Khan. But few prominent supporters of Brand’s ‘revolution’, if any, have said anything that is genuinely critical of elite power; especially of the corporate media, including the BBC. We have, for example, discussed de Botton’s corporate-sponsored ‘branded conversations’ here. 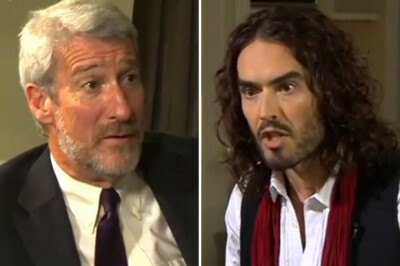 It is understandable that there was much praise for Russell Brand’s Newsnight interview and New Statesman essay. To a large extent, this signifies the desperation of people to hear any challenge to the power-protecting propaganda that we are force-fed every day. But two crucial factors here are that Brand was selected to appear by media gatekeepers; and that media institutions, notably the BBC, escaped serious scrutiny. If Brand was a serious threat to the broadcaster’s projected image as a beacon of impartiality, he would not have been chosen.